Descrizione: The Shell Company of Nigeria Limited, 1960. Hardcover. John Danford (illustratore). First Edition. 4to - over 9¾" - 12" tall. Color painting illustrated. 103p. Fine copy in the original blue cloth. Publisher's deluxe full blue morocco stamped in gilt, minor rubbing of front hinge. Langue: Anglais. John Danford OBE was an artist working for the British Council in Nigeria; the Danford Collection of African Arts and Crafts is a nationally important collection at the University of Birmingham. 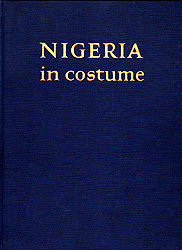 These 48 full page colour reproductions of his paintings show the costumes, uniforms and ceremonial dress of the diverse peoples of Nigeria; the text describes the significance of the details. With a foreword by the Prime Minister of the Federation of Nigeria Sir Abubakar Tafawa Balewa. Preface by Mr. W L Stewart general manager of the Shell Company of Nigeria Limited with a blindstamp signature. Illustrations include: Benin woman chief in ceremonial dress, Festival dress for the Ekong dance Ibibio, Sir Ademola II Alake of Abeokuta, Base drummer, Ilorin local Administration police band, Mother and child Cameroons, Yoruba girl, Ilorin weaver and more. Unpaginated, navy cloth boards with bright gilt lettering on front board and spine, bright red endpapers. Boards slightly scuffed with mild edgewear; interior clean and crisp with no inscriptions.